The Imperial War Museum sold some metal construction sets. An interesting thing is that these sets combine both Meccano and Eitech compatable parts. i.e. Both Imperial and Metric parts. 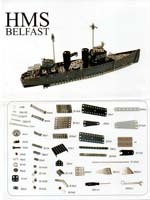 The instruction leaflet for the light cruiser, HMS Belfast.